An important area to understand is the definitions of the “stakes” that you are playing poker at and the type of “betting limit” game you are playing. If you don’t understand this you could find yourself playing at the wrong table for the amount of money that you wish to play with. Lets start with the definition of Poker Stakes. The “stakes” determine the bet sizes that you play with and are normally described with two numbers as follows $0.25/$0.50. The first number is the size of the small bet usually called the “Small Blind” and the higher number is the size of the big bet usually called the “Big Blind”. The minimum bet in each round of betting is usually determined by the size of the big bet. The higher the stakes of the game then the higher the pots you can win (or lose) are and also the higher the requirement for the amount of money you need to sit down at a table with. See our Introduction to Poker Bankroll Management article for more information. The limits of the poker game you select have a big impact on how the game is played as it determines the rules for how players can bet during the hand. This is the most common limit type and is very straight forward. The minimum bet you can make is one big bet (also called big blind). There is no limit to the maximum you can bet, so you are able to bet all of the money (“chips”) you are holding (called your “stack”) if you wish. The minimum raise is always the size of the previous bet or raise. That is all quite straight forward. The only point that may need a little more explanation is the minimum raise so lets look at an example. You place a bet of $0.50 and the other player raises to a total of $1.50. So he has called your bet of $0.50 and then raised by a further $1.00 to a total of $1.50. If you then wanted to raise again then the minimum that you could raise would be the size of his raise which was $1.00. So you would have to call his total bet of $1.50 and then raise a further $1.00 or more. So the minimum total bet would be $2.50. Limit Poker is a bit more complicated to understand. Players can then raise by increments of one small bet. So if the small bet was $0.25 then a player may raise to $0.50 and then the next player could raise again to $0.75 etc. After the first betting round then in later betting rounds then the bet and increments are the big bet. So in our example above it would now be a big bet of $0.50, raise to $1.00 then to $1.50 etc. 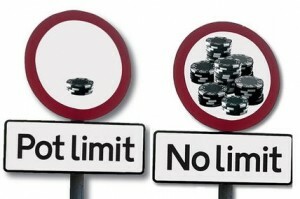 The third and final type of limit is called Pot Limit and is a middle ground between no limit and limit. The limit to the maximum you can bet is the amount of chips in the pot. In the first round of betting a player has bet the big bet of $0.25 and another player has called that bet. The total in the pot is now $0.25 + $0.25 = $0.50. The Pot Limit = Amount of Chips currently in the Pot + The amount it would cost you just to Call. So lets say that we wanted to raise. We have established that the pot is currently $0.50. If we just wanted to call the current bet it would be $0.25. So the pot limit is $0.50 + $0.25 = $0.75. So the maximum we could raise would be the pot limit of $0.75. Lets take this one step further. We raise by the pot limit of $0.75 – if the original player wanted to raise again what would be the maximum he could raise after our raise? Well …. work through the formula again. Amount of chips currently in the Pot is $0.50 + $0.75 = $1.25. The amount it would cost him just to call would be $0.75. so the “pot limit” and hence the maximum he could re-raise would be $1.25 + $0.75 = $2.00. Hopefully that gives you an understanding of how pot limit works. Its not as complicated as it first appears once you get used to it, and of course if you play online poker then all the calculations are automatically done for you and on screen in front of you. Which Stakes and Limits should I play? Lets start with which Limit you should play. As a beginner player we would highly recommend you start with No Limit as this is the simplest without needing to understand the more complicated calculations and rules of limit and pot limit. No Limit is also the most popular form of poker played today so there are more tables available online in this format. To decide what Stakes you should play at depends on how much “bankroll” you have available to play poker with. Your bankroll will be the total amount of money you have put aside to play poker. Once you have determined your total bankroll then we can teach you how to responsibly manage that bankroll and help you work out what stakes you should be playing at. This is all covered in our Bankroll Management Introduction article.